Jesus, beaten and tired falls from the weight of the cross that has been placed upon Him. 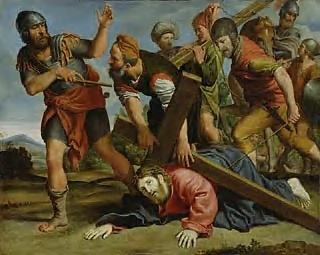 Jesus shows His humanity by showing His human difficulties of carrying the physical cross. Yet, the cross was more then just physically heavy but was spiritually heavy as well. Have you added to the weight of the cross by turning from Jesus and following your own path? Have you tried to help Jesus by following Him and turning away from sin so not to add to the weight of the cross? We all have fallen on our faith journey. It is not in the falling that defines us but it is in the getting back up, picking up our cross and following Jesus again. We are human and we will fall at times. God knew this and when Jesus came down to earth He gave us the sacrament of Reconciliation. We are able to fall and ask for forgiveness. Jesus forgives us because we are asking from a contrite heart and knows that within us we want to do better and follow Him. Think as if you are walking and trip and fall and you get up and dust yourself off but sometimes you need something more then that quick dust off. You need to use soap to get out that grass stain. No matter how much you try you will walk around with that stain till you use the soap. Jesus through reconciliation is that sin remover that we all need at times. He helps us to be able to continue on. If we do not get back up we are allowing sin to control our lives and also those things in life that may have us down. It is not only sins that hold us down under the cross but those things we struggle with in our lives. It may not be something that cause us to sin but maybe an illness, pain, relationships, inner struggles, etc... Each of them we carry on that cross with our sins. The great thing is that when we accept Jesus as our Savior and turn to the sacrament of reconciliation our cross does become lighter. Every day we get up and carry our cross. Somedays we carry it better then others and even sometimes we fall and need the strength to get back up and carry on. It is through Jesus’ grace we are able to do this. Until tomorrow, God Bless, and may you always be able to stand after a fall and remember Jesus will be there for you. R. (19b) A heart contrite and humbled, O God, you will not spurn. R. A heart contrite and humbled, O God, you will not spurn. "Time after Time" with a Twist.